Artificial intelligence: Are you ready for the fourth industrial revolution? Thanks to revolutionary advancements in robotics, web services and artificial intelligence (AI), we’re standing on the brink of a fourth industrial revolution. Building on the innovative thinking that jump-started three previous life-changing eras – steam-powered mechanised production, mass production assembly lines, and the first electronics and IT-based automations – we’re about to find out how this latest evolution will take us places we can’t begin to imagine. In the most disruptive industrial revolution yet, AI advancements are infiltrating our existence at every level, whether they’re in the guise of IBM Watson’s Jeopardy-playing prowess, or Uber’s self-driving cars. The businesses we run, the jobs we perform and the lives we live will never be the same again. Should we be worried? With every new era comes fresh concerns that the latest advancements will usurp our role as humans, and make our work redundant. From driving our cars to diagnosing the sick, if machines are being trained to do our thinking for us, will we still need to think for ourselves? And perhaps more importantly: Will we still have jobs? With the widespread introduction of robotics into the manufacturing industry, countries like China, where populations are high and labor is cheap, have been growing their production capacities to previously unheard of levels. It’s only natural that there’s also been some concern that foreign advancements like these will continue to wreak havoc on the economies and competitive abilities of developed countries like the US. But instead, with Chinese companies setting the example, America is set to reap the benefits of the robotic revolution. Rather than continuing to outsource large numbers of jobs to emerging market countries where production costs are cheaper, American companies are now capitalising on the evolution of robotic manufacturing to bring offshore production back home. Taking advantage of new technologies means lower costs and quicker response times, as goods are manufactured closer to the source of demand. This resurgence in local manufacturing is great news for the US, especially since research indicates that as much as 30 per cent of goods currently imported from China for use in industries like fabricated machinery, transport and computers could be produced here by the year 2020. That translates into a $20-$55 billion dollar annual increase in output, and it’s all thanks to the new level of efficiency made possible by advanced robotics. But the manufacturing industry isn’t the only sector being reinvented by recent developments in artificial intelligence. The service industry is experiencing enormous benefits that go hand-in-hand with automating business processes. Much like the manufacturing industry, human back-office functions in the service sector have suffered from outsourcing, as companies look to lower costs and increase focus on core areas. As a result, workers in customer service, data processing, medical transcription, and a host of financial positions have been downsized, and we’ve all been forced to deal with the fallout in terms of privacy concerns and degraded customer service. Rather than replacing human jobs, today’s AI systems are allowing companies to make the most of knowledge workers by removing much of their grunt work, and reducing spending. By utilising sophisticated robots to automate tasks that typically demand a human-level of reading, comprehension, and decision-making, these duties are being completed faster, cheaper and far more effectively. Everything from invoicing to customer service and from procurement costs to compliance can be streamlined and made more cost-effective through the use of robots that think and learn intelligently. Even better, an AI-driven system frees up time and resources, giving back-office workers the opportunity to focus on productive analyses, and the strategies that can lead to better business performance. Companies are finally in a position to use compliance as a tool for growing their business. At AppZen, our insights into the future of artificial intelligence are based on experience. Our clients look to us for cutting-edge, AI-powered automation that can vastly improve their expense report auditing. Take the example of the global, high-tech manufacturing company that was struggling with their expense review and audit process. Despite an expense-processing team that ranged across the US, Eastern Europe, and Asia, the company was only capable of manually auditing less than 4 per cent of its expense report submissions, and was suffering financial losses in the form of system misuse and undetected fraud. The business was also vulnerable to compliance risk because of its inability to properly inspect every expense report submitted. This is not an unusual situation. It’s simply too expensive and time-consuming for personnel to check every expense and verify every receipt, each time an expense report is processed. In order to maintain some semblance of compliance, many companies are reduced to manually reviewing a random sampling of their very large volume of expense submissions. That’s where AI technology is helping revolutionise the modern workplace. With the ability to read, understand and analyse every expense, AI systems allow back-office teams, like that employed by our global manufacturing company, to audit 100 per cent of their expense reports. This means more time and expertise can be focused on the small number of expenses that require specialised experience or knowledge. Processing workers keep their jobs, compliance improves and efficiency levels climb exponentially. AI systems are changing the job scene as we know it, and nowhere is this becoming more evident than within the service sector. It’s true that certain positions may become obsolete, but they’re quickly being replaced by others that forgo arduous, repetitive tasks in favour of a more demanding level of professional ability. 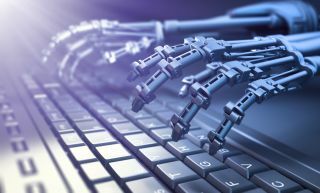 In this new and improved workplace environment, AI-based chat bots are dealing with customer queries in a way that’s becoming virtually indistinguishable from that of their human counterparts. And as we step into a landscape of living and working smarter, we can expect many of yesterday’s time-wasting frustrations to be replaced by better efficiency and increased productivity. Welcome to the fourth industrial revolution.